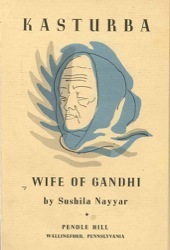 Numerous books have been written about the legendary Mohandas “Mahatma” Gandhi, but nothing about the woman who stood by his side, shared his successes and failures, even being imprisoned with him and giving up a life of wealth for one of utter poverty. The author corrects this with Kasturba: Wife of Gandhi. 71 pages.